Since gadgets and the like first came out, scientists all over the world are in a race to shrink their sizes. It is not enough that you hold the device in your hand or fit it into your bag, they just have to get smaller. But smaller is not the only criterian, theses gadgets or gizmos have to perform better and with better battery life. To achieve this aim, scientists have tried making each and every component in the gizmo smaller and one such part is molecular wires. Scientists at Tokyo institute have developed a new form of wire that not is smaller than their predecessor but is also better at conducting electricity. 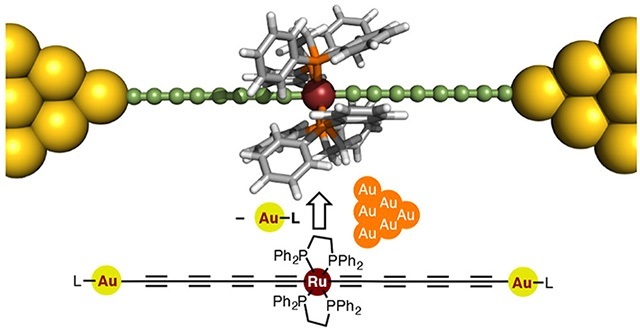 These new form of molecular wires are filled with organometallic ruthenium which gives it better conducting. The current forms of molecular wires are much different to the ones invented by the scientists up at Tokyo. In the sense, that these new molecular wires get their high conducting power from a different source. As devices get smaller, their component parts also get smaller, that’s a no brainer. But molecular wires are just the building blocks in such devices and maybe one of the most important yet fundamental of all parts. By carefully designing these molecules, scientists have tried to make beeter contraptions for us to use. These new form of molecular wires are in the form of a metal- electrode- molecular- metal- electrode junction. This includes a polyene molecule which is an organic chain like molecule. These new form of molecular wires are based on the engineering of the energy levels of the conducting orbitals in the wire. Is the new form of Molecular Wires better? Scientists used scanning tunneling microscopy to understand the level of conductance in these new form of molecular wires. What they found was that these new molecular wires are better than the standard or other fully organic molecular wires. This brought scientists to explore the origins of the superior conductivity in molecular wires. They found that the properties that gave these molecular wires their high conducting properties came from orbital splitting in the molecular wires. This orbital splitting brings about changes in original electron orbitals in the atoms of the molecular wires to make a new hybrid orbital. This new form of orbital facilitates electron transfer between mental electrodes and molecular wires. This finding is rare to see in current MMM junctions. The most important factor that gives these molecular wires their higher conductivity is the narrow gap between the highest and lowest molecular orbitals. The new technique formulated by scientists in making these molecular wires exploits this knowledge in enhancing the molecular wires conductivity. Using the same MMM junction in these molecular wires along with the extremely narrow gap between the highest and lowest orbitals, scientist have come up with a new form of molecular wires that has unprecedented levels of conductance. In this digital world, no accounts are safer because there is always a scope for the malicious hackers to get into the accounts and steal our information. As so many people are struggling to safeguard their accounts, Google has launched their new “Google’s Titan security key” to preserve and protect your accounts online. In general, to protect your online accounts from hackers, you have to be careful in keeping a secured password and also you have to be reasonably good with the memory or else you will simply miss your password. Even when you have both, there is still a possibility to sneak through from your account for hackers. So, to add another layer of protection the new Google’s Titan security key will be helpful. 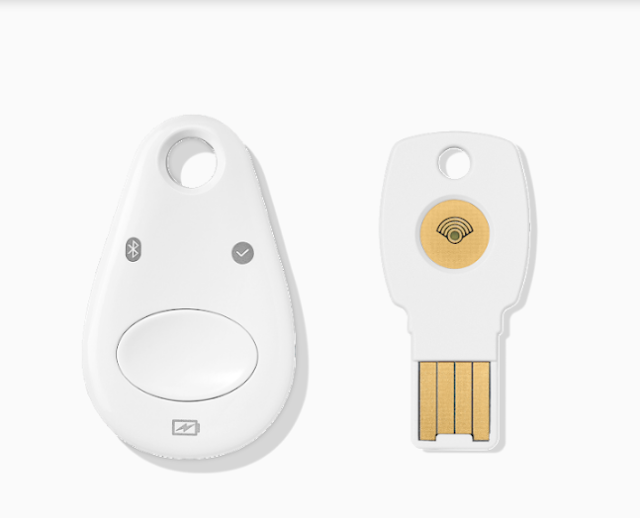 Google has started selling its new small piece of hardware from Aug 31, and it is called as the titan security key. It is specifically designed to add an extra layer of protection to your online accounts and online security. Although Google has launched this extra layer of security, but it also has faced criticism for producing the Google titan security key in China through the partnership of feitian, company. I am saying according to the report of CNBC. Now, after seeing this most of you might be curious to buy this Google’s Titan security key. And some might think what is precisely titan security key and how it’s going to help them. If these questions are wondering in your mind means don’t worry, I am going to explain them in this article. What is Google titan Security Key? Google Titan security key is a piece of hardware that acts as the extra layer of protection to your online security. 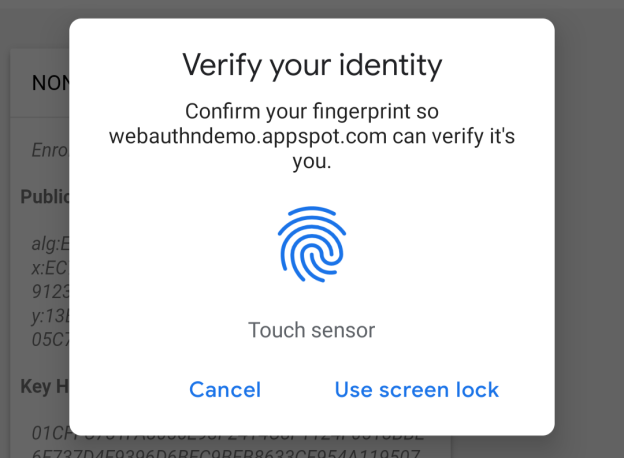 This tool is following FIDO standards for two-factor authentication (2FA) to verify a user’s security key, and then it verifies the address of the login page. This device is particularly helpful for high-value users such as IT managers and admins. The titan security keys work only work with the popular browsers, which supports FIDO standards. The hardware chip in the Google security key includes a firmware specially engineered by Google to verify the keys. Now, then we have learned about Google titan security key. Let us go into the further steps of Google titan Security key. Google’s new titan security key is having good features to protect us from online threats. Although most people hesitate to buy Google’s Titan security key, its features will attract you to buy this product. The Google’s Titan security key provides the cryptographic proof that users are connecting with the legitimate services, which they originally registered their security key. So it will help you to stay away from all kind of the phishing attacks. Along with that, it has a two-factor authentication option as well. The small titan security key has a hardware chip that is specially designed by the Google developers, which help to verify that the keys haven’t tampered. These chips are specially designed to resist any physical attacks such as extracting firmware and secret key material. This new tool is compatible with the all the FIDO standard browsers including Google Chrome. These are available in two form factors such as (USB/NFC/Bluetooth and USB/NFC). Titan security key can provide security key enforcements to the available Google cloud customers. It allows all the admins to use these security keys in their organization as well. Titan security keys can also be used in authenticating the Google and other services which the help of the FIDO standards. Therefore, this is also a useful feature for all the people who strive to protect their accounts. The new titan security keys are compatible with the superior protection program of Google. It is one of the most robust security offerings in the Google. This feature helps to protect your Google accounts of anyone at the risk of the targeted attacks. These are the new features of the Google’s Titan security key. Now, let us get into the other factors such as price and other aspects. As you, all know security keys are standard in the corporate environment. Moreover, people generally utilize it in the corporate world to make sure that only authorized users are accessing remote apps and other sensitive applications of the company. They use these kinds of keys apart from the password, Pin, Biometric, and 2FA or two-step verification systems to protect their networks from hackers. Google Titan security key exactly does that secures your accounts, and it works seamlessly with its Google owned products like Gmail, G suite apps, and so on. You can also use this with other websites and apps as well. As this key is fully compactable with the FIDO rules, it simply stands out in online security. Now, most of you might be wondering about what is FIDO right “FIDO is nothing but a new set of technology agnostic security specification designed for strong Authentication. More than 260 companies accept it, and they are part of the FIDO alliance some of those companies are Google, Facebook, Amazon, PayPal, and Microsoft, etc. As said that Titan security key is phishing resistant. So you can protect your accounts from devastating phishing attacks. Google has even said that since it has rolled out the titan security keys to its staff, it hasn’t been a single phishing attack got through the security key. So that strengthen the security key it can save you a lot. Google has started selling this from Aug 31st, and you can start making the purchase of the Titan device from the Google. Google is selling this tool for $50 in Google online Store. If you want to purchase the Google titan security, then you can buy it on Google online stores. Most of the people think that this little key isn't worthy of $50, but I bet you, this is key is better than its price. It helps you to stay with peace of mind as it provides the security that is priceless. So, this is it all about the google titan security key. Now, in this Google’s titan security key post I have explained everything about the Security key. It is up to you; let us know your views on the Titan security key. Whether you like the security key or you don’t like it either way comment below. So Chrome has just turned a decade old and Google celebrated by making some major updates like an almost full change of the user interface and like with all major updates- a performance improvement as well. But that’s not all that was in store for Chrome. Google also added shape detection and other features to boost security as well, like using biometrics in web based applications. But the tinkering is not over just as yet. Google recently released its beta for Chrome 70 that includes the shape detection, web authentication and some other updates as well. Google uses this shape detection API to bring a device’s feature of detecting faces, barcodes and text to web pages. Shape detection constitutes three APIs in one bundle. You have the face detection software, barcode detection API in shape detection and of course text detection API also in the shape detection API. Basically the shape detection API pretty much does as the name describes but for further information Google has given its own description of what you can expect from its shape detection API. For face detection in the shape detection API- given the image bitmap or face or blob even, the face detection API gives you the location of that face and the eyes, nose and mouth in that face. To gain more control over the process you can always prioritize speed over performance when it comes to search results for faces. You could even limit the number of faces given as results, using this method in shape detection. The barcode detection API in shape detection API decodes the bar codes or QR codes for you into strings with values ranging from single sets of digits to multi line texts. The text detection API in shape detection API is meant to read Latin- 1 text used in images. The use of shape detection in Chrome could open up a host of useful opportunities for developers. Adding facial recognition in shape detection API could mean better security like Apple’s FaceID. Text detection too has a lot of opportunities where it can be used in. QR or barcode reading while it will be more useful in other places, it is less useful in places like the US where QR codes or barcodes are not used much. To add more security Google has added Web authentication update with support for a PublicKeyCredential type. This allows web based applications to use and create strong cryptographically attested credentials for their users. This feature was present in Chrome 67 for desktop by default and now has been activated for Chrome Android as well. Another feature added by web authentication on Chrome is the use of finger print or biometrics. This uses the feature present on phones or the mac to give users extra security when using web based applications. That means on various websites, web operators can ask for your finger print using the scanners on your phone or mac to verify your identity. As talks of 5G do the rounds, there is talk of much faster internet speeds and data speeds as well. For all those speeds newer connections, newer frequencies and newer tech needs to come out. Talking about one of those speeds- internet speeds, now. A new spin- off MaxWaves is set to be tested out that will give us are super- fast wireless internet. This is a new form of antenna that directs the electronic signal electronically in the right direction thereby optimizing the signal in whatever weather conditions, be it rain, sunshine or snow. In a few years- time as people switch on to faster data such as 5G or 6G even, there is need for better tech. As data transfers increases, the amount of data rates too will increase and in 2025 is poised to increase by more than 100 times the current amount. What this means is that antennas at the current base stations will have to transmit much higher amounts of data than what they are currently doing. The new tech to increase the transmission rates of data or for extremely fast internet speeds is being developed as we speak. 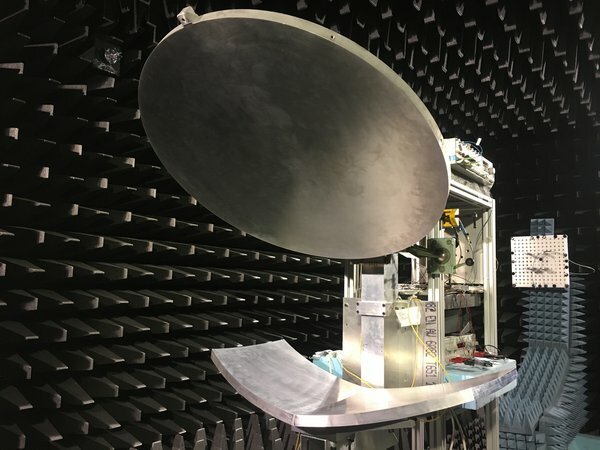 Researchers have developed a new form of antenna technology in which base stations can communicate electronically to wirelessly transfer internet or data between themselves. This new form of wireless internet will allow large amounts of data to be transferred that is not currently possible. The amount of data that can be transferred will take place at never- before- seen- levels between mobile base stations. This wireless internet will give 5G and 6G networks their fast transmission speeds. This wireless internet that came about by the new antenna technology will be much faster than your average day speeds and the antenna technology that goes into making this new form of wireless internet will supposedly have a dual purpose as well. This antenna technology will allow the radio beams to change direction electronically for optimum transmission so that the dishes holding these antennas will not have to physically move to enable transmission. This new form of wireless internet that uses new antenna technology can adapt to all types of weather ensuring the best internet speeds irrespective of the weather. This new form of wireless internet also uses much less energy than what is consumed at present making it much more effective. The electronic control that is used in this wireless internet can be adapted to work best in wind, storm or rain. The electronic beams that are used in this form of wireless network ensure that no cables are needed underground and the entire system can be configured using electronic means. This means that the size of network connection can be scaled up at a short notice, temporarily, like for example at a major event. This new feasibility study will build up on what was learnt with the first fewtests and will begin commercialization shortly. Today’s world is all about doing things fast. We want our phones to work faster, our computers and even our toasters. So, scientists are continually on the lookout for the next big thing that will make computer and the like run faster. 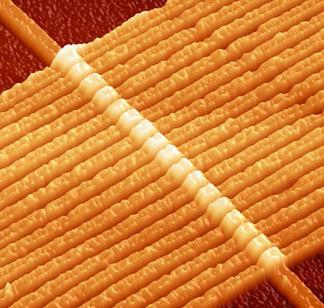 One such thing discovered by scientists is a memristor. If you’ve not heard of it, then its no wonder as the term was coined just recently or with the discovery itself. Memristors not only make your computer or phone work faster but will also cut energy consumption,like you wouldn’t believe. Memristor is a way of arranging advance computer parts on a chip so that it performs faster and with less energy consumption. Where will Memristors be used? Memristors, according to scientists, will improve performance especially in those low power environments such as your smartphone. It can also be used to make an already efficient thing even more efficient like in the case of supercomputers. Semiconductors in the industry make things fast by ensuring faster processing but when it comes to receiving and sending data, that is the part that takes time as these semiconductor processors have to work with other parts to do it. Memristors is a solution to this problem. Named as combination of memory and resistors, which you may have already figured, memristors can process and save data in memory all in the same place, which will significantly speed up calculations and such. Traditional means use bits of 1s and 0s but in the case of memristors, they work on a continuum. The team behind memristors use smaller blocks to break down a large mathematical problem which improves the flexibility and efficiency of the system. These smaller blocks are called “memory processing units” and can be useful in implementing machine learning and artificial intelligence algorithms. They can also be used in areas of simulation such as in predicting the weather. Mathematical problems in the form of rows and columns are directly imposed on the grid of memristors. Operations that multiply and sum the rows and columns in the table are then done simultaneously. Whereas in the case of a traditional processor, it would perform mathematical calculations such as the sum and multiplication of rows and column individually taking a lot of time and energy. While with memristors all this happens in one step itself. Many science and engineering problems are very difficult to solve because of their complex forms and numerous variables needed in their models. Memristors can be used to simplify such problems and model them in the correct manner to get the right answer taking up much less time and with that energy. When it comes to partial differential problems, solving them exactly is near impossible. To get an approximate value itself is the job for supercomputers. These types of problems involve loads of data and getting a memristor to sit in a supercomputer and perform these calculations will save up a lot of time and get results much faster.